My husband loves gadgets. He has a lime-press and an extra long shoe horn (I’ve never used it but he swears it’s a necessity). A couple of years ago he bought me a cherry-pitter, even though we hardly ever eat cherries. He used to have a wristwatch with a built-in TV remote. He looks longingly at single-purpose items in catalogues while I cringe at the thought of finding room in the cupboard for a tool we would be lucky to find a use for every two years. Although I harrass him mercilessly about how silly most gadgets are, I bought one this summer. 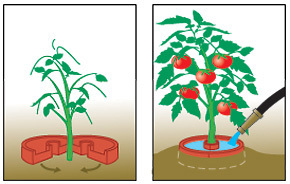 Lee Valley makes red plastic tomato craters that are supposed to help your tomato plants grow bigger and better. It promises to suppress weeds, block cutworms, concentrate water at the roots, warm the soil to increase root growth and help prevent blossom end rot. The catalogue also says that the red crater will increase yields and make the fruit set earlier. Since I seem to have trouble with blossom end rot every year and am always up for a bigger harvest, I thought they would be worth a try. They come in packages of three and I chose to install them around three plants in the backyard, leaving three other plants craterless. It took a little bit of work to get them properly installed, even though they come in two pieces and fit together nicely at the bottom of the plant stem. The soil around the plant has to be carefully excavated to make room for the dish-like shape, which is a delicate job. I didn’t want to injure any roots that might be near the surface. That was back in May. Since then, I have kept an eye on them, watching to see if they would make a difference. When I watered them (which I only really did during the dry month of July), I poured water directly into the round trough, just like the picture in the catalogue told me told. It was supposed to go directly into the root zone, but I couldn’t tell. And of course no weeds grew through the craters. They grew around them in every direction, yes, but not inside that particular eleven inches. Here in September as I compare the plants, they all look the same, crater or no crater. Yield is not terrific (although that could be the tomato variety or something else I did wrong) but it’s passable. They all began to ripen at about the same time. So much for the red spectrum of light stimulating growth and all that. I can’t see a difference. The only point in their favour? I only lost about two tomatoes to blossom end rot. I am not willing to give the craters all the credit for that one, though. I worked hard to make sure I watered regularly all summer, which is supposed to nip that problem in the bud (so to speak). 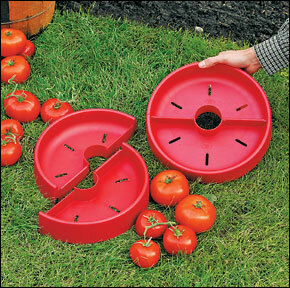 My verdict is that the tomato craters might be fun for a gadget-collector, but they’re not essential garden tools. I wouldn’t invest in them again because they didn’t seem to accomplish much except sit in the garden and look ugly, and I have an aversion to unnecessary plastic. I would, however, put them in the ‘excellent mistake’ category: I learned something new and nobody suffered permanent injury. Like many other mistakes I’ve made in my life, I just decided not to do that again. This entry was posted in Uncategorized and tagged backyard, family, food, gardening, vegetable. Bookmark the permalink. I haven’t seen those in the States yet, but I probably would’ve tried them too after all of the problems I’ve had with blossom end rot too. Do you happen to know how to prevent that stuff? (Sigh). Not really. It is so frustrating, isn’t? Gorgeous fruit you get all the way to maturity and then blam–a rotting bottom. I know that even watering is a big part of keeping it from happening. 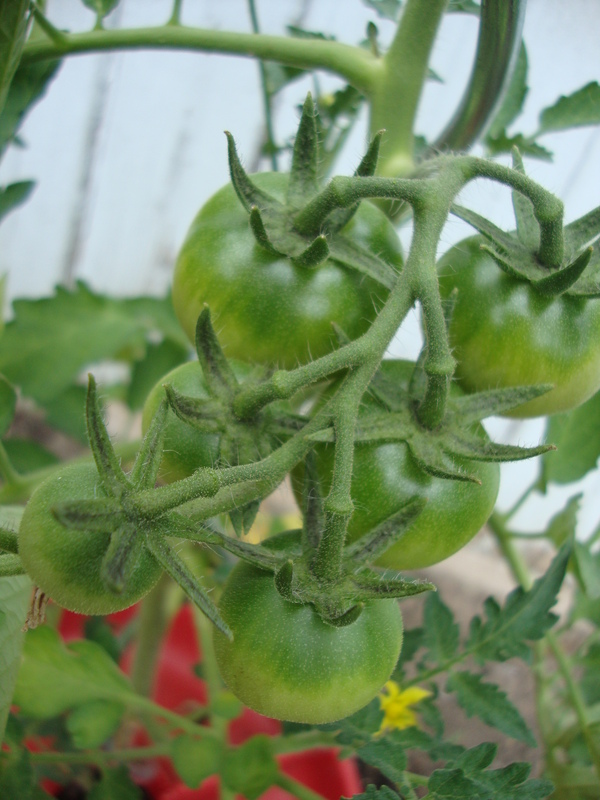 Generally healthy plants won’t have too much trouble, either, and the newer varieties of tomatoes help. Very frustrating. Ditto for that squash blight fungus stuff that ruined my cantaloupes and is now problematic for my pumpkins. We were lucky enough that the blossom end rot only affected the first tomatoes that ripened a few weeks ago. The rest of the fruits haven’t had a problem with it. Yes, at 8 years old I don’t imagine you were taking careful notes about pest control–you were probably too busy jumping in puddles and picking dandelions! Blossom end rot is caused by calcium deficiency , there are many ways to stop it add egg shells to the hole when you plant along with a good hand full of gypsum pellets. you should till some lime into the soil when you prepare it about two weeks before planting. There are also many calcium sprays to mist your plants with during the season to help prevent it, and your right regular watering keeping the soil from extremes is also important. As for the red color helping I have used a red plastic mulch around the bottom of my plants for years and it does give me faster and bigger tomatoes and peppers than without it. Your other plants if in the same area would have benefited from the red color even if it wasn’t directly under them. The egg shells around the base also help keep cutworms from your plants.